Many factors contribute to a healthy aquarium ecosystem. Everything from the substrate you use to the plants you add can change the environment. Carbon dioxide is one of the elements that must be balanced in your tank. CO2 refers to the chemical composition of the carbon dioxide molecule, which is two parts oxygen and 1 part carbon. Plants consume CO2 when they ‘breathe,’ and it’s an essential part of any tank within which aquarium plants are growing. 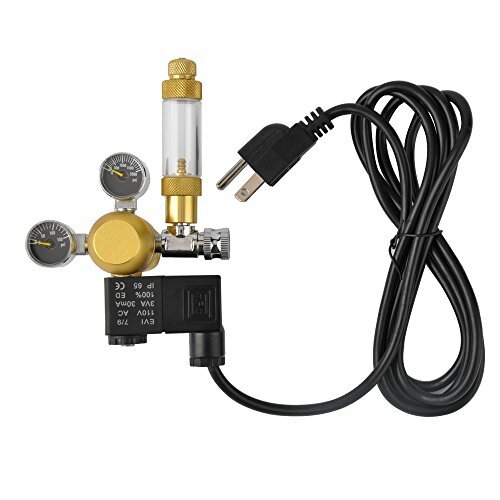 If you find yourself ever wanting or needing to add additional CO2 to your tank, a CO2 regulator is a crucial piece of the equipment required. OK, so you probably have a few questions? What does carbon dioxide have to do with an aquarium? Why do I have to regulate it? How does an aquarium CO2 regulator work? We’re here to answer all of your questions and more. In this article, you’ll learn what features to look for in a CO2 regulator, how to set one up, and which are in our opinion the best aquarium CO2 regulators on the market today. What Happens if Co2 Levels Fall Too Low? What Happens if Co2 Levels are Too High? To start with, let’s define carbon dioxide. This odorless, colorless gas is essential to the respiration cycle of almost all living organisms, including fish and plants. In large bodies of water where fish live, including lakes or oceans, the water chemistry is regulated naturally. This includes carbon dioxide, oxygen, pH levels, minerals, etc. In a closed aquarium, all of this has to be controlled manually. An aquarium CO2 regulator doesn’t work on its own. It operates in conjunction with a CO2 cylinder, CO2 diffuser, and pressure gauges. The CO2 cylinder contains carbon dioxide in liquid form. When it passes through the CO2 diffuser, it is transformed from a liquid into a gas. Without a regulator, you can’t control how much is being released into your tank. The pressure gauges show you how much CO2 is in your cylinder and tank. These are also known as inlet and outlet valves. The high-pressure gauge (inlet valve) correlates to the CO2 cylinder. The higher the gauge, the fuller your cylinder. If the arrow is in the red zone, this means that your cylinder is out of gas. The low-pressure gauge (outlet valve) allows you to control the pressure of the carbon dioxide entering your aquarium. You can control the outlet valve through the pressure knob on your regulator. Turning it will increase or decrease the amount of pressure. These are just a few of the separate parts your CO2 regulator needs to function. There are significant advantages to having one for your aquarium. A balanced flow of CO2 can help all your aquatic life forms thrive. Not all living creatures breathe the same way. The fish in your aquarium inhale oxygen and exhale carbon dioxide, just like we do. Plants do the opposite—they take in CO2 and release oxygen. This is why they’re so useful to have around. Producing oxygen is one of the reasons why having plants in your aquarium is an advantage. Aquarium plants also help to get rid of the organic waste that collects in your substrate. They leech the nutrients from refuse, preventing it from building up. In natural bodies of water, such as the oceans and lakes, plants are recognized as an indicator of health. When they thrive, aquatic life does too. Plants can help replicate a fish’s natural habitat and allow certain species of fish to practice particular behaviors. Depending on the type of fish you have, this can include mating, sheltering, and more. Basically, plants help your fish feel more at home. A CO2 regulator guarantees that your plants will never run out of carbon dioxide. This is particularly important as your plants grow larger. There is only so much they can take from the atmosphere of your tank without running out. Your aquarium is a miniature ecosystem, everything is dependent on something else. 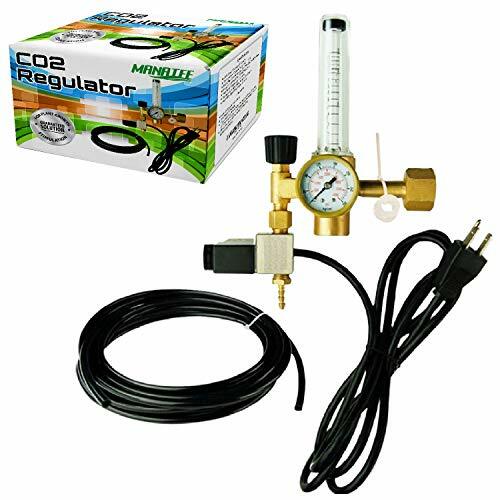 Having the best aquarium CO2 regulator isn’t just good for your aquarium plants. By promoting plant health, your fish will be healthier too. Growing plants adds more oxygen to the water for fish. They also consume more nutrients, in this case, waste that collects in the substrate, such as uneaten food and feces. Without the plants, this waste pollutes the water and can ultimately cause fish to become sick. In natural bodies of water, there is always movement of some sort. This flow carries dissolved oxygen from the plants to all the fish, sustaining them. In your aquarium, there is very little movement. Plants are therefore one of the primary oxygen sources. CO2 regulators let you control how much carbon dioxide is being released into your tank. Just like with the pH of your tank, achieving the correct balance is the key. You want all the life in your aquarium to flourish. This means finding the optimal range of carbon dioxide for your tank. Every aquarium will eventually become host to a population of algae. There’s nothing to be concerned about as long this growth doesn’t spiral out of control. Algae are a hardy form of plant life that can survive in nearly any body of water. From pools to ponds and lakes, algae can make anywhere a home. All they need is light, nutrients (e.g. nitrogen), and carbon dioxide. There are many different species of algae that can grow in your tank. Regardless of what type of algae you have, all of them need carbon dioxide to survive. Algae can grow very rapidly under ideal conditions, which is something you definitely want to avoid. This is where the ecosystem theory comes into play again. Strong, healthy plants should be responsible for consuming most of the nutrients in your tank. In turn, this will stop algae from spreading unchecked. If your plants weaken or get sick, there isn’t as much competition for resources. If carbon dioxide levels drop too low, the plants in your aquarium will suffer. Plants use it for photosynthesis to develop normally. Without enough, growth will start to slow down. If enough time passes without adequate carbon dioxide, growth will stop entirely. Your plants will begin to wither and die off. Rotting plants in an aquarium can result in a host of unpleasant consequences. The water quality will start to deteriorate as the plants rot. This will happen faster if your plants are a species with floating leaves. These types of plants have a faster rate of decay than others. Chemicals, such as nitrate, phosphorus, and ammonia, will spike. As you may have guessed, this isn’t ideal for the water chemistry of your tank. In high enough concentrations, ammonia can kill your fish. Even low levels of ammonia can impact your fish if they are exposed to it for long enough. Algae can bloom out of control under these circumstances. Too much phosphorus and nitrogen aren’t as harmful to algae as they are to other aquatic life. In fact, these opportunistic plants use the compounds to their advantage to grow faster. Too many algae in your tank will deplete resources your fish need to survive. This includes oxygen, which drops as the algae continue to spread. Too much carbon dioxide is just as bad as too little. The only difference is that the effects of high levels take less time to manifest. Plants may appreciate increased carbon dioxide, but fish won’t. When there’s too much in your tank, this means there likely isn’t enough oxygen. Your fish will start showing signs of stress and oxygen deprivation. You’ll notice that they aren’t as active as usual, swimming slowly or even staying still to conserve oxygen. They may also swim to the surface of your tank, gasping for air. If you leave carbon dioxide levels high for too long, your fish will suffocate. Introducing too much carbon dioxide to your tank at once can instantly kill your fish. This is why a CO2 regulator is necessary. You can’t see or measure carbon dioxide manually—an avoidable mistake could cost your fish their lives. Now you know why managing the carbon dioxide is important, how should you go about choosing the best aquarium CO2 regulator that’s right for you? Buying one should involve careful consideration. You shouldn’t go out and buy the first one you find online or at your local pet shop. As mentioned before, the CO2 regulator is only one part of the CO2 system. You have to make sure your carbon dioxide cylinder of choice is compatible with the model of regulator you buy. Certain regulators will not fit with just any cylinder. For example, some regulators are built to only work with five-pound cylinders. Others only fit with the smaller, 24-ounce cylinders (also known as paintball cylinders). Ideally, your CO2 regulator should last you for a while. You don’t want to have to replace it just because it isn’t suitable for the cylinders you chose as a novice. When it comes to choosing small or large cylinders, think about your individual aquarium and your goals. If you have a smaller tank, a five-pound cylinder might be too much. If you’re planning to add more tanks or expand your aquarium, pick a regulator that works with large cylinders. Your CO2 regulator shouldn’t intimate you. You should factor in ease of use when you’re browsing through regulators. Now, every aquarium owner is different. Some of you may actually enjoy getting extra-technical with your equipment. For the majority of us, simplicity is a priority. We don’t want to be baffled and frustrated when setting up a regulator. It should be straightforward to use and maintain. There is a degree of fine-tuning involved with any CO2 regulator. After all, the system will need adjusting from time to time. Still, you don’t want to spend too much time fiddling with knobs and struggling to adjust CO2 levels. This is related to ease of use but warrants its own mention. A CO2 regulator needs to be easy to read and understand. You don’t want to have to squint at pressure gauges, for example. If the design includes very thin needles, it can be hard to read from a distance. This might not seem like a big deal, but it can be irritating in the long term. You’ll be checking your CO2 regulator on an ongoing basis so readability matters. Think about investing in a dual stage model. These variations are two regulators built into one. The extra regulator lowers the risk of carbon dioxide fluctuations in your tank. Dual-stage CO2 regulators process carbon dioxide in a two-step process. Pressure is regulated twice rather than just once before it enters your tank. Remember that stable pressure is crucial for balanced levels. With dual regulators, you also get insurance against potential mishaps. The additional regulator is another layer between the carbon dioxide cylinder and your tank. Your CO2 regulator has a serious responsibility for maintaining the health and life of your fish and plants. It should be as well-built as possible to avoid malfunctioning. Be wary of cheaper regulators, no matter how tempting the cost savings may be. If a regulator is made of low-quality materials, you can’t expect much from it. If it breaks it could end in disaster – don’t jeopardize the safety of your fish and plants. Look for materials that are built to last, such as stainless steel. This metal is rust-resistant, long-lasting, and easy to keep clean. Brass is another great alternative. Always check to see what accessories are included. If you already have things like a diffuser or solenoid, you don’t need duplicates. If you’re starting from scratch, you might be able to get your whole setup with one purchase. Take note that you’ll have to acquire these items one way or another. The more that is included with your regulator, the less shopping you’ll have to do later on. Without a needle valve, your CO2 regulator won’t be of much use. This pressure relief valve gives you control over how much carbon dioxide enters your aquarium. You can tune the needle valve to attain precise levels—like how many bubbles of carbon dioxide are released per second. A solenoid valve is not a necessity, but we highly recommend that you have one. This device can function as an automatic power switch for your regulator. You can set it to release carbon dioxide only at certain times. Why waste it at night when your plants aren’t using it? Program your solenoid to only release carbon dioxide during daylight hours. With a solenoid, you have a greater level of control over your CO2 regulator. This is also helpful for those of you who tend to be forgetful. A bubble counter is another non-essential component, but useful nonetheless. This add-on serves as a visual guide: you can see the flow of carbon dioxide in action. Aside from being interesting to watch, you can monitor how many bubbles are being released in your tank. The check valve is a crucial safety mechanism every CO2 regulator needs. It prevents water from your tank reversing into the regulator and damaging it. Inlet and outlet gauges allow you to read the PSI (pounds per square inch). As we covered earlier, these are also known as high and low-pressure gauges, respectively. Carbon dioxide enters your aquarium from the regulator through a tube. Just as with the CO2 regulator itself, prioritize quality over price when it comes to the tubing. Your tubes should be explicitly manufactured for CO2 regulators. A non-specific tube can rip due to pressure. If the material is porous, carbon dioxide leaks can occur. If your CO2 regulator comes with washers, check their size. If they are irregular, it might be difficult for you to find replacements. A drop checker will tell you how much carbon dioxide is circulating in your tank. Add drops of a reactive solution to the drop checker reservoir. You’ll know if levels are too high or too low, depending on the color of the gauge. Below, we have compiled a list of the current top models on the market today. In these reviews, we cover features, specifications, and the pros and cons of each. This dual-stage model is energy efficient and solidly built. It comes with all the necessities: pressure gauges, relief valve, and solenoid valve. One of the great aspects of the S.T. International aquarium regulator is versatility. It runs on universal voltage, which means it can work wherever you are in the world. You also have the choice of using disposable cartridges over the standard connector. The pressure gauges are large and colorful, which makes checking the pressure a breeze. The design allows you to adjust the pressure without much hassle. You don’t need to have expert coordination skills for these knobs. The solenoid valve doesn’t produce heat, making it energy efficient. You can schedule carbon dioxide output without wasting electricity. It also operates quietly, which is good for both you and your fish. Finally, S.T. International offers you a two-year warranty. Warranties are always a bonus when it comes to aquarium equipment! Dimensions: 5 x 5 x 6 inches. Can be used with disposable cartridges. The pressure gauge is user-friendly. Safety certification (CE & PSE). No light on the solenoid valve. 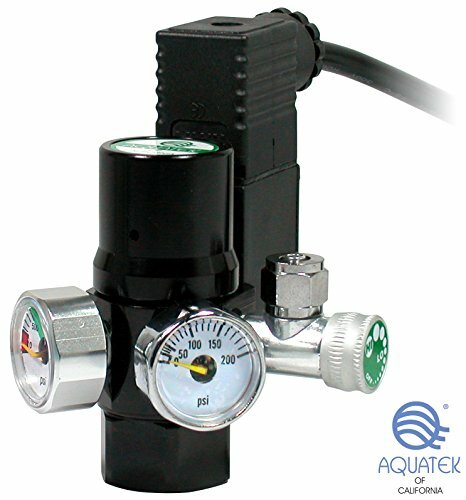 The AQUATEK CO2 Regulator Mini will suit most aquarium owners. As the name suggests, it is compact and discreet. If the thought of a large regulator looming over your tank dismays you, this product is an excellent choice. Despite the small size, the pressure gauges are not a challenge to read. One of the nice features of this regulator is that it comes with accessories included. The check valve is one indispensable item you’ll be able to take off your list of things to buy. The bubble counter and solenoid valve are added perks. As for the remainder of the setup, compatibility won’t be an issue. The Aquatek will work with small cylinders, which are readily available. It also fits with the majority of high-density, carbon dioxide-friendly tubing. Dimensions: 3.5 x 3 x 4.5 inches. Bubble counter with integrated check valve. Comes with bubble counter and check valve. The solenoid valve has a light. Compatible with paintball (small) carbon dioxide cylinders. Small knobs are hard to adjust. Accessories (solenoid, bubble counter, check valve) have been reported to encounter issues after a year. This particular model is not specifically made for aquariums, it is marketed for use in indoor gardens. Still, you can safely use it for your aquarium if you take basic precautions. The pressure gauges are built to read higher pressure levels for spaces with plants. For your aquarium, the pressure will stay fairly low: this is normal. Note that it’s recommended to purchase a bubble counter for this regulator. As it is more powerful than aquarium-specific regulators, it will help you supervise the flow in real-time. With the aid of an adapter, you can hook this regulator up to small as well as large cylinders. This flexibility makes it ideal for aquariums of all sizes. This precision regulator makes controlling carbon dioxide levels effortless. It is very sensitive, enabling ultra-precise adjustments. You’ll also get an abundance of tubing included. As this is something you normally have to buy separately, this is a great bonus. A solenoid valve is also included so you can put your system on a timer. Compatible with small and large cylinders. Regulator valve can be controlled with precision. Can take time to adjust pressure. Solenoid buzzes and can heat up over time. 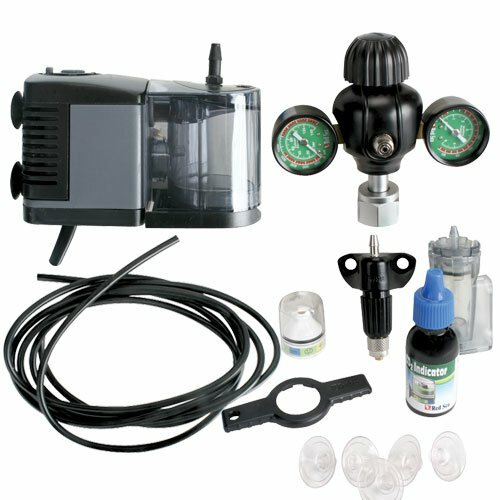 This system comes with nearly all the accessories you’ll need to introduce carbon dioxide into your aquarium. If you haven’t bought anything yet, this product can jumpstart your carbon dioxide equipment setup. Aside from the regulator, you’ll also receive a bubble counter, check valve, reactor, and monitor. Three meters of tubing are included in the box too. The Red Sea Fish Pharm system can be set up in aquariums ranging from 10 gallons to 125 gallons. If you have a small tank now and decide to upsize later, you’ll be able to keep the same system. The large knobs take the challenge out of adjusting flow and pressure. The pressure gauges are sizable and colored for good readability. You can take comfort in the quality of design; the CO2 regulator and associated parts are built to last. Dimensions: 15.2 x 13.7 x 3.9 inches. Includes bubble counter with check valve. Includes three meters of tubing. Almost everything you need is in the box. Appropriate for almost any size of aquarium. Only works with paintball cylinders. This miniature regulator has a lot of accessories included. The only items you’ll have to get on your own are a cylinder and a diffuser. The included bubble counter, check valve, and solenoid valve are just the start. You also get a wrench and an extra washer. The wrench is a unique addition that can be used for more than just your CO2 regulator. What’s not to like about a free tool? Compatibility-wise, this regulator works with any cylinder size and most tubing. The solenoid valve that comes with it runs in near silence. No buzzing, humming, or other irritating noises. Although small, the knob to regulate pressure turns smoothly—you won’t find yourself struggling with it. The pressure gauges will give you a precise readout. You can trust the readings to know exactly when it’s time to change your cylinders, for example. Steadiness is another beneficial feature of the DoubleSun. Fluctuations in pressure are virtually nonexistent. Dimensions: 4 x 6 x 3.2 inches. Lots of accessories in the box. Smooth-turning knobs for pressure adjustment. Works with small and large cylinders. The solenoid valve can get hot. Small pressure regulators are hard to read. No two aquariums are exactly alike—ecosystems can differ dramatically. How you regulate your carbon dioxide flow will depend on several variables. The size, population, and overall health of your aquarium are just a few. Setting up your CO2 regulator isn’t as complicated as you think. If your regulator came with instructions, follow them as directed. If not, you can start by attaching your regulator to the carbon dioxide cylinder. Make sure the regulator is firmly screwed in. Connect your tube to the regulator, making sure it’s tight. If you have a solenoid valve, plug it in. The same goes for your bubble counter. Adjust the pressure gauges as necessary, and you’re done. You might want to monitor your aquarium for a few hours after you first set up your CO2 regulator. Perform a drop test to be sure carbon dioxide levels are stable. A CO2 regulator is beneficial for all of the life in your tank—this includes the plants as well as the fish. Combined with regular maintenance and good practices, you can enjoy a healthy aquarium. 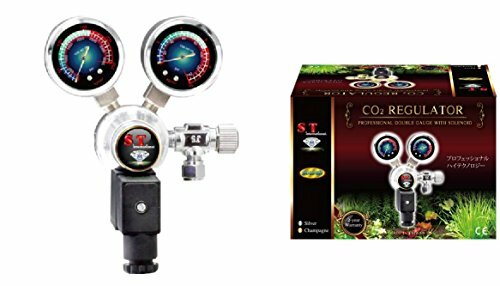 Following our advice and reviews, you should find the best aquarium CO2 regulator for your needs. If you have any questions or comments, drop us a comment below and we’ll get back to you. We welcome your feedback, so please don’t hesitate to share your opinion!